We’ve covered the rejuvenation of Alfa Romeo quite extensively in the past two years or so. That’s because it’s a brand that really tugs at the heartstrings of any history-loving car enthusiast, having been at both sharp ends of the industry at various points over the last 100 years or so. Through those peaks and troughs have come some of the most desirable vehicles ever made, with racing pedigree to boot, and that makes the company hard not to love. 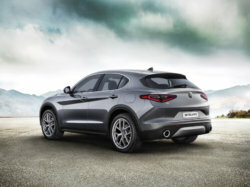 To the Stelvio then, the company’s first attempt at an SUV. The SUV market is the fastest growing thing to hit the motoring world since the internal combustion engine itself, so of course everyone wants a slice of the pie. Except that consumers don’t really want an SUV, they want a saloon car with an elevated seating position. And in turn manufacturer’s have obliged with SUVs that don’t go round corners very well, nor can they mount much more than a roadside curb because of all the compromises required. 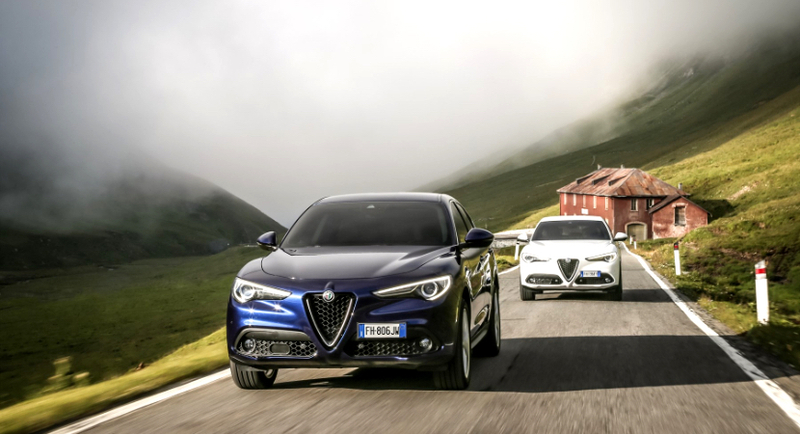 In the Stelvio’s case it may well look like an SUV but at heart it really does maintain the prowess of the Giulia saloon car on whose platform it is built. It somehow manages to avoid all the compromises one would normally find in a modern ‘performance’ SUV and truly delivers the best of both worlds. For starters there’s been equal emphasis placed on the driver’s enjoyment and comfort. 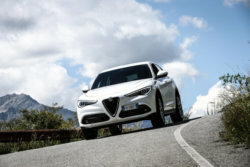 Those two things are very difficult to achieve unison, but there’s 50/50 weight distribution as you’d expect in a sporting machine, along with highly advanced independent suspension all round and possibly the best steering system (shared with the Giulia) to grace any normal production car in the last 10 years. Those factors mean the Stelvio isn’t trying to control body roll through a very stiffy sprung and badly damped setup, nor does it need massive wheels and low profile tyres to maintain grip. In fact this is the most comfortable and compliant soft-roader that I’ve ever driven over rough terrain, yet show the Stelvio a corner and it’s quick steering, rear-biased all-wheel-drive system and trick suspension will belie its raised centre of gravity. In my view this car redefines what we’ve come to know a soft-roader should deliver. Read also: Alfa Romeo Giulia: can it compete with the Germans? It’s rapid too. The 2.0 litre turbocharged four pot, mated with a great eight speed ZF automatic gearbox, produces 206kW and 400 torques which boils down to best in class power-to-weight ratio. That’s achieved through extensive use of ultra-light materials, such as carbon-fibre for the driveshaft, and aluminium for the bonnet, rear wings, engine and suspension. The Stelvio will propel itself from 0-100km/h in under 6 seconds and that’ll give most hot hatch owners something to cry about at night. And just look at it. It’s a proper cliche and all, but the Italian’s really do know how to pen some pretty machinery. The subtle curves and creases tend not to show up well in photographs, but in the metal the Stelvio manages to hide it’s bulk well where other SUVs start to look rather ungainly. 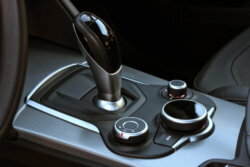 The interior flows similarly, with simple, intuitive controls and nicely integrated features. Deep set dials are a trademark of Alfa Romeos, adding an element of depth to the instrument cluster. All the little bits adding up to a sense of theatre in the cabin. From a pricing point of view, the Stelvio will cost you R817,900. For that you get things like automatic headlights and wipers, dual-zone climate control with rear seat outlets and a beautifully integrated colour display for things such as rear camera, infotainment and navigation functions. And a 6 year, 100,000km maintenance plan. LED headlights, adaptive cruise control, keyless entry and heated seats are all to be found on the options list. Pretty standard issue then when compared with its rivals (think X3, Q5 and GLC) and around the same money when you compare spec for spec (if not a little cheaper). It’s a tough old market, this premium-sporty-SUV game. 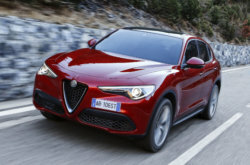 The Stelvio delivers in spades when it comes to the act of driving, but whether most potential SUV owners care for that over, let’s say, a few more gadgets I don’t know. Alfa South Africa obviously has an additional hurdle to overcome with pretty poor public perception, albeit completely unfounded. 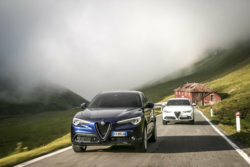 What’s safe to say is its new lineup of vehicles are class leading, Stelvio included and that should start to see the tide turn.